The City of Cambridge will hold a third session of the Cambridge Climate Emergency Congress on Saturday, March 6, from 9 a.m. – 1 p.m. in City Hall, 795 Massachusetts Ave. 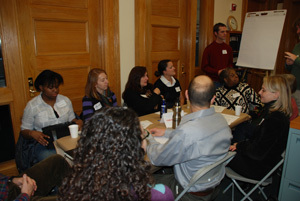 Previous sessions were held on December 12, 2009 and January 23, 2010. Click on above link to see most recent Cambridge Climate Proposal Revised 2-28-10. For more information, please contact Victoria Harris, Aide to Councillor Sam Seidel, at 617-349-4279 or vharris@cambridgema.gov. While world leaders delay on taking serious action on climate change, the City of Cambridge, along with other cities worldwide, is weighing in. We know that time is short to deal with the climate crisis, and we know that we can take actions that will not only reduce our contributions to global climate change but will make our city a more livable, just and vibrant place to live and work. 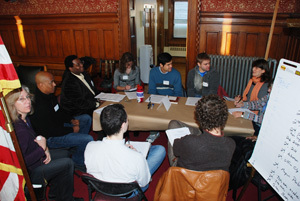 The Climate Congress will recommend actions to the Cambridge City Council to meet those goals. Approximately 100 delegates from Cambridge community groups, businesses, institutions and faith-based organizations are participating in the Congress. Cambridge began to respond to climate change in 2002 and has done a great deal since, but climate science now says we must do much more than we have so far to prevent a global disaster that will profoundly affect every one of us. That is why this is an emergency and that is why seven former Cambridge Mayors have endorsed this initiative. For more information, please contact the Mayor’s Office at 617-349-4321. When we all pitch in, we can achieve amazing results!